During his postgame speech following a win over the College of the Siskiyous on Oct. 17, American River College football head coach Jon Osterhout pleaded with his players to all get on the same page mentally and not relax with a big lead. 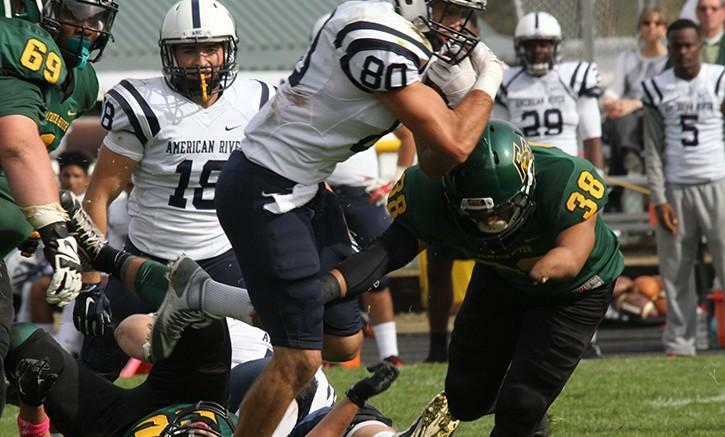 The team responded Saturday with a 44-14 win at Feather River College, scoring three touchdowns in the first quarter and one in every subsequent quarter while the defense allowed only two scores for the game. ARC quarterback Jihad Vercher said that the team’s improvement comes from a better mindset. Several players and coaches noted that the focus in practice over the week was on finishing the game out regardless of the score and not letting up, a problem the team has had in recent wins. In previous blowout wins against both Siskiyous and San Joaquin Delta College, ARC had built leads upward of 30 points before the offense became almost nonexistent. That was not the case Saturday at Feather River. Grush noted that the difficulties the offense had with big leads in previous weeks as well as the long day the team had endured. The defense was stout as well, allowing only a touchdown early in the second quarter and midway through the fourth while never allowing Feather River to get into a good flow offensively. Defensive coordinator Lou Baiz said his unit’s attention to detail was the reason for its success. “(We) got some turnovers. Took away the run game for the most part and made them one-dimensional,” Baiz said. Baiz was impressed with the overall performance and thought they played level throughout the game. “We gave up the one big play, but other than that I thought we were consistent,” he said. ARC returns home to host Sierra College at 1 p.m. Saturday. The team is now looking for a third straight league win as it pushes toward the stretch drive. Be the first to comment on "Offense comes together, defense shines in complete game for ARC"